Gluten Sensitivity & Sourdough: Is Sourdough Gluten-Free? Why is gluten so hard to digest? What's the relationship between gluten sensitivity and sourdough? Is sourdough gluten-free? Thankfully, all those buckwheat pancakes were good for me, and so was the gradual introduction of soaking, sprouting, and sourdough methods. My gluten sensitivity is now a thing of the past. Yet the questions remain: Why is gluten itself often harmful? Does sourdough make it more easily digestible? If so, how? The smallest unit of a protein is called an amino acid. When any 2 amino acids bond together, they form a dipeptide. Tripeptides are any 3 amino acids bonded together. An oligopeptide is a small number of amino acids (but still more than 3) bonded together. Finally, a protein is at least 1 long chain of amino acids. In grains, the gluten proteins are divided into 2 categories: the glutelins and the prolamins (source). In wheat, the glutelin and prolamin proteins are called glutenin and gliadin, respectively (source). Although glutenin may contribute, gliadin is widely recognized as the main cause of gluten sensitivity (source and source). It is these 2 gluten proteins — present in varieties of wheat — that I will focus on in this post. Glutenin and gliadin form a protein network responsible for many of the characteristics of dough, such as its plasticity and elasticity (source). It molds easily under pressure and tends to revert back to its original shape once pressure is released. This allows it to expand to incorporate gases during breadmaking, but also resist just enough that these bubbles don't pop! Gliadin proteins are dense and globular with a low surface area-to-volume ratio. This means that they allow glutenin chains to slide freely past in the protein network, contributing to the plasticity of dough. Additionally, they have high concentrations of the amino acids proline (about 1 proline in every 7 amino acids) and glutamine (source). The proportions of these proteins in different types of wheat (einkorn, emmer, spelt, kamut, etc.) determine the relative strength of each dough. Glutenin and gliadin are digested in the stomach and small intestine by enzymes (source). In glutenin's case, enzymes cleave its long chains into oligopeptides, then into tripeptides, dipeptides, and free amino acids (source). It is these latter 3 that absorb into the body and go on their merry way. Now enter gliadin. In sensitive individuals, gliadin is broken down into oligopeptides but no further (source). This is due to its low surface area and specific amino acid sequences that inhibit enzymatic activity (source). As it turns out, proline's cyclic structure contorts gliadin enough that special enzymes are required to degrade it (source) . tTG also changes glutamine into glutamic acid via a process called deamidation. This increases the likelihood of an autoimmune response — where the body not only targets the modified gliadin, but also tTG itself. (Source, source, and source.) This results in inflammation. And so, these gliadin oligopeptides — resistant to further enzymatic degradation — may damage the gut by blunting villi and increasing permeability (source and source). This can lead to celiac disease, nutrient malabsorption, and more (source). I was 13 when I first tried my hand at my very own sourdough starter. I whipped up flour and water and tried not to check on it too often. It sprang to life as obligingly as I could wish. I even documented its progress with a twice daily photo shoot. I didn't ask the question then, but I ask it now: what does sourdough do? Is sourdough gluten-free? Does it actually solve the problem of toxic, mayhem-causing gliadin fragments in our gut? Then, as discussed in this study, notable strains of LAB hydrolyze wheat proteins (including gliadin, and the non-gluten proteins albumin and globulin) by factors greater than 50% over a 24-hour period. This means that the bacteria and their associated enzymes are effectively cleaving gliadin proteins before they ever reach the gut. This is supported by rising levels of free proline as it is released from degraded proteins. As we already know, gliadin is rich in proline. …in a healthy gut, lactic acid bacteria may help digest gliadin as well (source, source, and source). Just another argument in favor of eating your probiotics. Another study suggests that einkorn, most likely the first wheat to be cultivated, may fit under the category of “breads with low contents of gliadin toxic peptides” (On Food and Cooking, page 466). So, is sourdough gluten-free? No. It does, however, make gliadin proteins easier to digest. Are there any other benefits to sourdough? In addition to lessening bread's affect on blood sugar, sourdough also provides an increase in available minerals by reducing phytic acid (source). It also delays staling and resists spoilage microbes (On Food and Cooking, page 544). Is It Possible To Heal Gluten Sensitivity? Why am I able to eat gluten today — in any form, sourdough or not? Perhaps it is because the damage to my gut was reversible. After eliminating gluten, it needed only the time and resources to heal. After a while, I gradually reintroduced gluten in its less toxic, sourdough form. To be sure, sourdough may not cure any gluten allergies or sensitivities, whether celiac disease or not. It doesn't even completely eliminate the gluten content. It is, however, a fascinating preparation method — bubbling away on countertops all over the world! — and it affects the toxicity of gliadin in a very real way. For some, it may even provide a means to eat bread again. 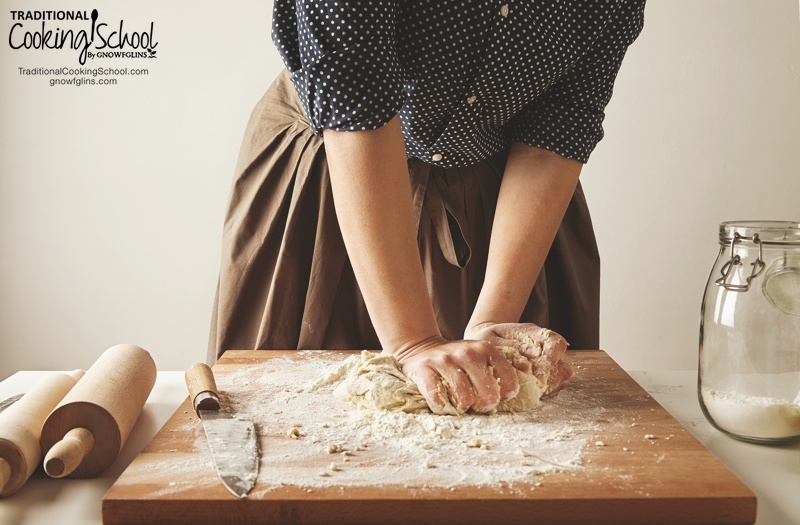 Check out our Sourdough and Einkorn Baking eCourses to learn more sourdough and baking with einkorn. Be sure to download our free No-Knead Einkorn Bread recipe, too! 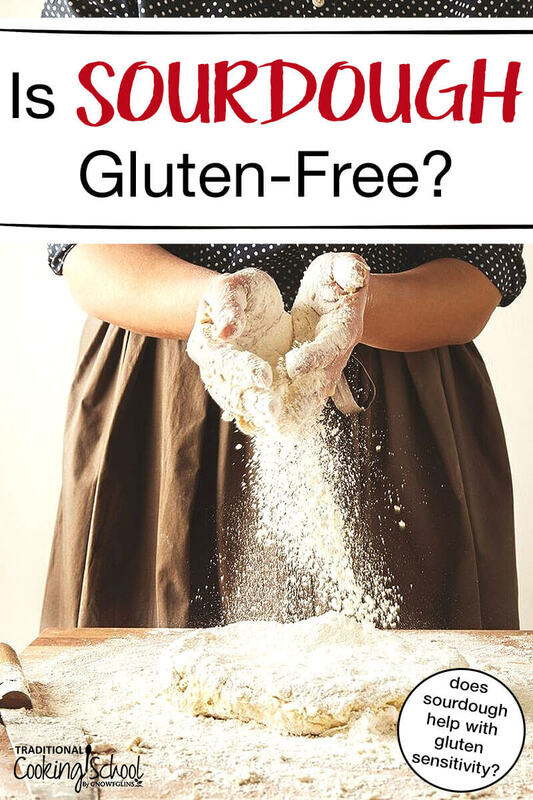 Do you have, or have you had, any type of gluten sensitivity? Has sourdough enabled you to eat gluten? Do you want to try it? Share your experience in the comments below! Wardee's oldest daughter, is a Traditional Cooking School child through and through. 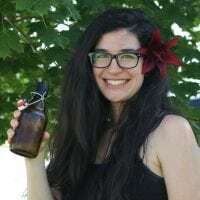 She enjoys reading biographies and long classic novels, adventuring at the Oregon coast, and learning about the chemistry of food and biology of our bodies. Sourdough, kefir, ginger beer, and apple chutney are her favorite ferments! She and her husband gave birth at home to a baby boy in March 2017. Since then, she can't get enough of anything related to pregnancy, childbirth, and breastfeeding (and she tweets about these topics here)! This is so so helpful! Very clear but thorough. Thanks Haniya! Thank you, Lea! So glad you found it helpful. Great explanation. Thank you Haniya! Its so exciting to have experienced gut healing as a result of sourdough einkorn baking methods and adding homemade probiotic foods to my and my family’s diet. Traditional Cooking School made all the difference in figuring out those keys to the healing process. Thank you for helping pave the way to understanding for other folks! Thanks, Sara! And well done on healing yourself and your family! That’s got to be one of the most exciting things, ever. I had migraine aura and headaches and eczema due to wheat, egg, and milk allergies. Once I completely cut those foods from my diet my symptoms went away. I have tried several brands of gluten free breads and even tried making my own with gluten free flour but they just don’t taste good. I started a gluten free sourdough starter and tried making bread using it and sprouted wheat flour and discovered that if I allow the dough to rise overnight then I can eat the bread with no symptoms. I have now converted my gluten free sourdough starter to a sprouted wheat starter and have made rolls, buns, cookies, and cobbler dough with it. Sometimes I use gluten free flour and sometimes the sprouted flour but another thing that helps is to make sure the flour is non GMO. Now if I could only figure a way to eat eggs again. I tried unsuccessfully to create a recipe for what I considered ought to be the holy grail of breads: sprouted sourdough. I always ended up with hard bricks, nothing like the fluffy bread I was going for. I realized that sprouted flour was killing the rise because the sprouting had eaten up all the gluten that causes it to rise. How do you get it to rise without the gluten? Did you add starches? Baking soda? Commercial Yeast? Thank you for sharing! Fairlight, I used this recipe from Cultures for Health http://www.culturesforhealth.com/learn/recipe/sourdough-recipes/sourdough-dinner-roll/ using sprouted wheat flour and yes, they are denser than breads with gluten but they weren’t hard and they were tasty. I wonder if the baking soda trick would work? That’s amazing, Donna! Stories like yours are always so encouraging and fun to hear. 😀 Thanks for sharing! I am allergic to wheat and gluten, but have a hard time refusing a lovely biscuit or piece of homemade pie. I have found when I eat traditional sourdough bread, I do not exhibit any of the symptoms I have with regular (naturally whole grain, not white ‘normal’ bread) good bread containing gluten and/or wheat. I will definitely be making my own sourdough bread now…and pancakes! Oh, and I am also allergic to eggs, but I have found that as my health and gut flora have improved, I can allow myself a couple of eggs now and then. Thank you, God! That was the worst thing about my allergies – even worse than being allergic to bacon! I will have to try traditional sourdough bread to see if it affects me. I have found a commercial loaf bread at Sams club that I can eat called Dave’s Killer Bread Good Seed bread. It’s organic and non gmo. Tomatoes will be ripe soon and there’s nothing better than tomato sandwiches made from home grown tomatoes! As for the eggs, I try them every couple months, in fact had them this morning. I use organic local pastured chicken eggs. By this afternoon I was having a migraine aura, so no go with eggs yet. Thank you for a detailed and well sourced, but still easily readable explanation. Genuinely very useful and has helped me properly get my head round it! I have gluten intolerance and a weekness for good buns for sandwiches. I have been reading and studying all the information I see on the Traditional Cooking School web site. The einkorn flour arrived and there are only three more feedings before I can start using the einkorn sourdough starter. I’m anxious to try new recipes with the starter and the einkorn. My husband keeps asking when I’ll be baking again. Thank you Haniya, for helping teach this old cook new methods that will only help in keeping our bodies healthy. I discovered I was gluten sensitve about 7 years ago. Stopped all gluten during that time. Last year I went to France for the first time and learned some folks were able to tolerate bread while in Europe so I decided to experiment. Oh-la-la…two weeks of blissful Paris croissants, baquettes, pain du chocolate! I couldn’t believe I had no stomach problems whatsoever. Upon my return to the states I thought, maybe I have healed my gluten sensitivitiy and went straight to my local high quality sourdough bread baker. No go; I had the old stomach pains I used to get before going gluten free. So something is up with gluten products made in the US, it would seem. What research I can come up with is that it could be the herbacides/pesticides that are legal here and not in Europe. Does anyone have similar experiences? So now, I am planning to experiment with Einkorn; I already have a gluten free sourdough starter I made about two years ago and will create an Einkorn sourdough from that. After my Paris experience I am very hopeful that Einkorn wheat will give me the opportunity to eat good bread here at home. Thank you for your website! Hi Mary Kay! That’s such an interesting experience. I’d never heard of the difference in herbicides/pesticides but of course it seems entirely (sadly) possible. I’d love to hear how the einkorn sourdough goes for you! Yes, Glyphosate (in Roundup). They are finding *this* may be the actual cause of stomach distress for many. Please research this topic. The basis for blaming glyphosates for gluten intolerance is one woman’s article with absolutely no sources. There are no sources because she is dead wrong about the use of glyphosates in the ripening of the wheat crops. In other words, she wrote her own opionin as if it was fact. What an interesting answer to someone who brings up glyphosate as a source of grief for so many. There is actually plenty of evidence, just not entered into databases and correlated. Monsanto’s finger are very long, oops – Monsanto now vanished as Bayer bought them out. Yet glyphosate is so very toxic, to the gut as well. As a child I generally avoided (fattening) baked good except my Mom’s occasional Homemade Bread which was always followed by negative symptoms. In my mid 20’s I went through counseling for anorexia & subsequently started eating “fattening” starches & breads & almost immediately began experiencing extreme classic signs of Celiac/Intolerance. I mean doubled over in pain, horrific flatulence, bloating, headaches, impared healing, and severe facial eruption’s (the latter all my life). When in my late 30s I quit all gluten cold turkey at the advice of a nurse-practitioner, I had complete abatement of symptoms in about a week.The positive response was so dramatic my Dr. never did the colon biopsy, the only available test at that time, so I never learned if I am “intolerant” or full blown Celiac but avoiding Gluten was a miracle cure. “Acne” FREE for the first time ever in my late 30’s and ever since! Now at 70 I find I can eat (SOME) sourdough, specifically that from “Aldi”. Some others may elicit some mild degree of negative symptom. I wonder if the rampant use of GMO grains in the US may contribute to this inequity in safety of different sourdough? Or perhaps the thoroughness of the souring process? I also note that the Aldi Sourdough is amazingly resistant to molding whereas some others, which do elicit symptoms, have gone bad quickly if not refrigerated? Thank you for this explanation and recipe for my own starter. Also interesting to note that a “healed gut” can sometimes tolerate an occasional cheat. How can you get a gluton free sourdough? I started mine from buying the gluten free sourdough starter from King Arthur flour. I keep it alive by feeding it with their GF flour mix. By the way, I did try Einkorn flour and I CAN tolerate it, and so I have started an Einkorn sourdough using my GF sourdough starter. I can’t say I love the taste of Einkorn that well, but it did make a good pizza crust. Have you found kneading and final prep in flour that hasnt had the long fermentation period might cause a gluten problem to those sensitive? Not sure of your question…I know that even sourdough made from regular flour grown in the states, WITH that long fermentation and kneading makes no difference to my stomach….still have stomach pains. Except, of course, if it is made from wheat from France! Thanks for such an informational article. My daughter has SPD (Sensory Processing Disorder) and it’s been suggested we eliminate gluten from her diet to see if she has a sensitivity to it and to see if it effects her behavior. That said, in making sourdough, do you find it better to do a slow fermentation in a fridge overnight for the most benefits? Thankaiva you!